In the dead of night there came a terrible storm followed by a huge wave which engulfed all before it. 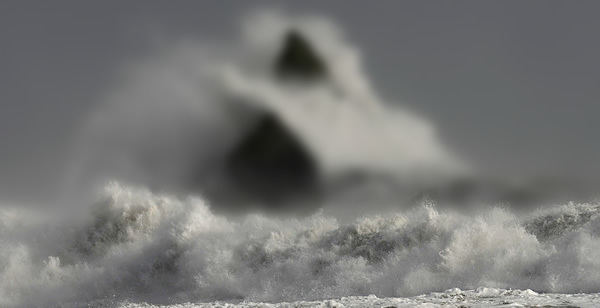 In that one night the Land of Lyonnesse disappeared below the waves never to be seen again. Linked to Arthurian legend Lyonnesse was a fertile and beautiful land South of the Cornish coast (now known as the Scilly Isles), where the Cathedral city of Lion sat atop the seven stones reef. Legend has it a single man, Trevelyan, rode furiously upon his white horse ahead of the gigantic wave seeking the high ground of Land’s End – loosing a horse shoe along the way. The oldest Cornish families lay claim to their lineage, the Trevelyan’s and Vyvyans, who have adopted the horse shoe or white horse motive on their family crests. It is oft said that on exceptionally calm days fisherman can hear the cathedral bells of the city of Lion. St’Michael’s mount now surround by water provides some evidence to the fable,originally known as ‘grey rock in the wood’ (Karrek Loos y’n Koos in Cornish) when it was surrounded by a deep wooded forest. During exceptional low tides Bronze age settlements have been seen between Islands along with a petrified forest surrounding St’Michael’s mount. This Spring a band of intrepid watermen and women will fly in from around the world to tackle this fabled crossing.